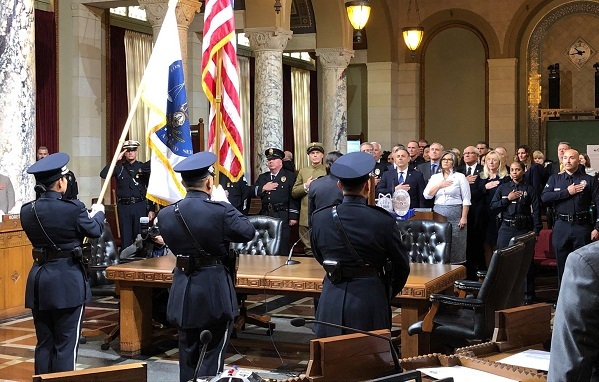 This week, I joined my colleagues Councilmembers Monica Rodriguez and Joe Buscaino in celebrating the 150th Anniversary of the Los Angeles Police Department. As the oldest department in our city, the LAPD has made history multiple times over. Among the most significant changes that the LAPD helped pioneer was the inclusion of women in police departments. On September 12, 1910 -- nearly 10 years before the ratification of the 19th amendment granting women the right to vote -- Alice Stebbins Wells became the nation's first female policewoman with arrest powers. Through her leadership and influence, generations of women would follow playing critical roles in the evolution of police departments to better serve and protect communities. The LAPD would also play critical roles in in protecting the peace during major events such as the 1932 and 1984 Olympics and taking on domestic defense roles during World War II after Pearl Harbor. The single event that for me best demonstrates the resilience and character of this department is the LAPD's response to the worst natural disaster in our city's history: the 1994 Northridge Earthquake. Communications across the city were down. Electricity, water, and physical infrastructure including roads and highways were severely damaged. Despite these challenges, LAPD officers reported for special duty en masse, not because they were ordered to appear, but because they knew they were needed. Despite the challenging circumstances and three LAPD stations closest to the quake's epicenter out of commission due to damage, the LAPD was able to maintain public order and ensure emergency services and repair crews could operate. When I think of the LAPD's motto "To protect and to serve" I think of that moment. Even during the most difficult and challenging of circumstances, this City can count on the LAPD. 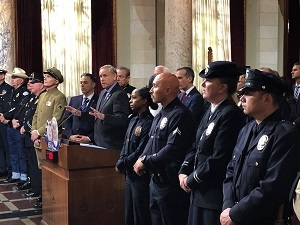 For this reason, and for the many times they have demonstrated their professionalism and excellence, we can point to this department as a point of pride for the City of Los Angeles.